The U.S. stock market indexes were mixed between 0.0% and 0.3% on Wednesday, as investors' sentiment remained pretty bullish following the recent rally. The S&P 500 index reached the highest since the early February, as it slightly extended its short-term uptrend yesterday. It currently trades just 2.0% below the January's 26th record high of 2,872.87. The Dow Jones Industrial Average gained 0.3% and the technology Nasdaq Composite was unchanged on Wednesday. The index futures trade between -0.2% and -0.3% vs. their yesterday's closing price, so expectations before the opening of today's trading session are negative. The European stock market indexes have been mixed so far. Investors will wait for the economic data announcements today: Philadelphia Fed Manufacturing Index, Initial Claims at 8:30 a.m., Leading Indicators at 10:00 a.m. Investors will also wait for quarterly earnings release from Microsoft, among others. The S&P 500 index will probably extend its short-term fluctuations along the level of 2,800 today. There have been no confirmed negative signals. 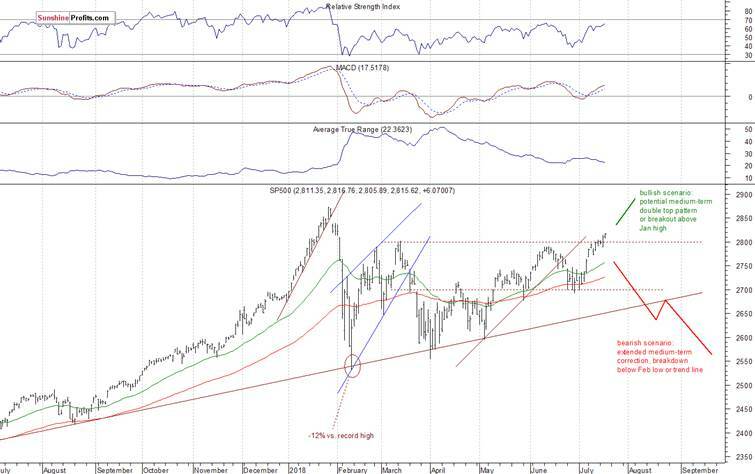 For now, it looks like a relatively flat correction within an uptrend.